The Plaza de Santa Ana, together with the nearby small streets which make up the Huertas district, is one of Madrid's most lively and vibrant areas, with hundreds of tapas bars, terrace cafes, pubs, restaurants and Irish bars all within a relatively small area. 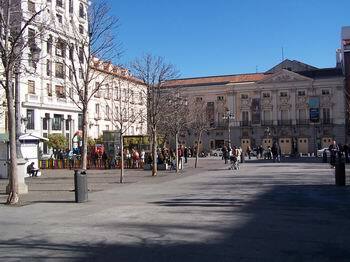 The square itself is located just a short walk from both the Plaza Mayor and the Puerta del Sol. It is also possible to walk to Madrid's main museums from here, making this area an ideal location to stay in the city. The following links show all our lodging around the Plaza de Santa Ana. For a self-catering property, we can strongly recommend this small, cosy apartment just round the corner from the square. The square was originally the site of the Convent of Santa Ana, founded in 1586 but demolished during the reign of José Bonaparte (Napoleon's brother), in 1810. In its place, the Plaza was created around 1848. On its east side, the Teatro Español may be found, whose origins go back to 1583, although it was rebuilt in 1807 due to a fire. In this theatre Spain's most important writers have seen their works acted out on stage. To the west, the unmistakable façade of the Reina Victoria hotel dominates the square. The hotel was built in 1916, the large front windows of its rooms enjoying truly spectacular views of the Plaza. Two statues in the square play tribute to two great Spanish personalities. 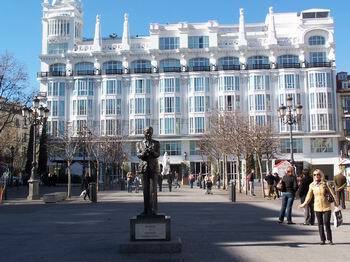 The first, close to the hotel, is of Pedro Calderón de la Barca (1600 - 1681), the famous Spanish playwright. The second, just in front of the Theatre, is of Federico García Lorca (1898 - 1936), poet and dramatist, killed by the Nationalists during the Spanish Civil War. Today, the square plays host to a large number of bars, cafeterias, restaurants and cervecerias (ale houses, although other drinks are also served). It is a wonderful place to just sit and watch the passers-by, to take a refreshing drink at one of the open-air terrace cafes, or to enter one of the many bars to sample a plate or two of tapas with a glass of wine. The square is particularly popular on Sunday mornings, when Spanish families come out in droves to buy a newspaper or a loaf of bread, and take a short stroll, interspersed of course by a glass of wine or three! During the summer months, the Plaza is packed from early evening to late at night as a younger crowd take over the terrace cafes before moving on for dinner or to dance away the early hours.